We’ve certainly seen a lot over the past century and a half of protecting those in greatest need, but rarely have we ever seen a year when our help has been needed more urgently. Two historic and devastating hurricanes struck millions of people and pets in the space of a few weeks, prompting multiple responses by three American Humane Rescue teams and our fleet of boats and giant animal emergency vehicles. Wildfires ravaged California, forcing people and animals to flee the giant flames. Massive cruelty cases uncovered by law enforcement cried out for our immediate response and compassionate care. Hundreds of thousands of abandoned shelter animals and those needing food, love, and life-saving medical treatment touched our hearts and received free assistance. And our work to unleash the healing, life-saving power of animals helped us save even more of America’s brave vets and abandoned pets. We hope you enjoy our newest stories of hope, healing and love, and please do follow American Humane on social media for breaking news and inspiring tales from the animal world. 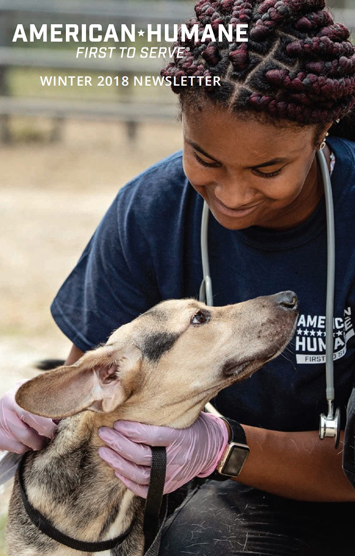 On behalf of the vulnerable animals we serve, thank you for your support of American Humane. Together, we are working hard to build a better and more humane world.